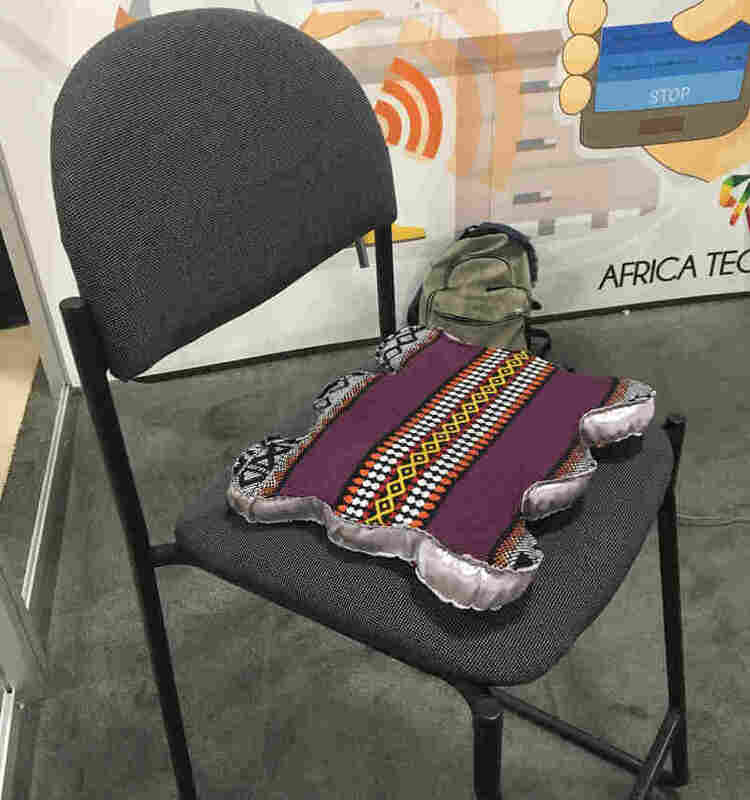 For The First Time, The Consumer Electronics Show Has 'Africa Now Tech' : Goats and Soda The entrepreneurs at the Consumer Electronics Show in Las Vegas have some interesting ideas. But what about the follow-through? 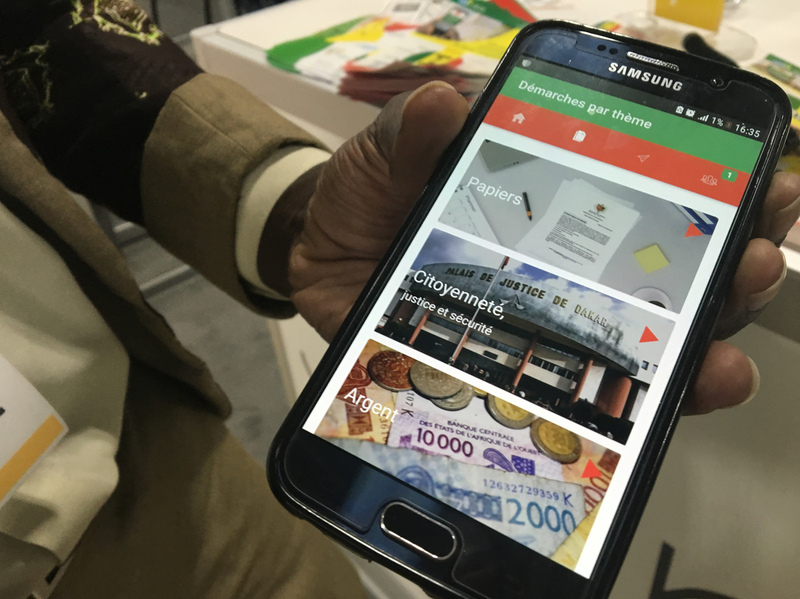 The E-Citizen app from Senegal uses photos and audio recordings. For example, click on a photo of a baby and select either French or a local dialect. You'll hear how to register a newborn child. Africa Tech Now, billed as the "No. 1 event showcasing African entrepreneurship," debuted at CES this year. The problem was, when I went to the Consumer Electronics Show in Las Vegas to cover it for this blog, no one had heard of it. Not the media desk, the information booth or even the Moroccan and Egyptian aisles, which are obviously African but weren't part of the expo I was looking for. I guess it's not surprising. Tech innovations from developing countries in Africa aren't exactly making headlines. Yet slowly and quietly, African countries have been ramping up their technology, much of it centered on social and economic issues like health monitoring and job creation. Governments are seeking tech-hub status, and investors have taken note. Last year, the Nigerian startup Andela raised $40 million to connect African web developers with international employers, and investment groups are buying into other businesses. When I finally did locate the Africa Tech Now display (after walking around hopelessly for an hour or two), I found a group of six startups from Mali, Senegal and Tunisia. Of the six, three were innovative, two had slick marketing materials but no product to show, and one was a nice idea but still has a way to go. Most social media relies on reading and typing, but what if it was voice-based? That's the idea behind Lenali, an app created by computer scientist Mamadou Gouro of Mali. On Lenali, users can select their dialect, type in or record their name, post vocally and comment vocally without having to read anything. Posts could be anything from personal updates to photos to news. Gouro even thinks people could use Lenali to boost their business. A mango vendor could post a photo, add audio that tells his or her location and ask people who want more info to comment by voice posts. "Everything is done without the need for writing skills," Gouro says, though the app does accept written posts as well. There is one drawback — the app can't read posts aloud. So users would have to rely on friends to post voice comments if they need something read or translated. "There's artificial intelligence, but we use natural intelligence," he says. In Senegal, most information is written in French — it's the official language, after all. The problem is, not everyone reads French. Instead, they may speak the local language Wolof, which has many dialects. And some may not be able to read in any language. The E-Citizen app uses photos and audio recordings in local dialects to help people navigate health, courts, jobs, taxes and other social systems. For example, clicking on a photo of a baby tells you in the language you select how to register your newborn child. Clicking on a photo of construction workers lists job opportunities. Currently, E-Citizen works in two local dialects and French. Entrepreneur Mamadou Diagne hopes to add more dialects in the next two years, and eventually he wants to create kiosks so people without devices can use the app, too. Electricity is hard to come by in rural Mali, so engineer Abdoulaye Gackou has created the Yeelen Solar Box, a solar-energy generator that can provide electricity to 10 homes. It's mobile, made from recycled material and runs for 24 hours on a single charge. The box is still in its prototype phase but should be available in the next year for around $1,820. From Senegal, 2v360 provides 360-degree photography to real estate and tourism businesses, to give potential visitors a more immersive view of properties. The website is impressive, but a rep said the company still has a lot of work to do. A wireless modem company from Tunisia called SpeedAir supposedly connects to drones, robots and smart cities, but there wasn't information beyond the booth's backdrop. And finally, the Hicchair from Tunisia is a hand-sewn seat cushion loaded with sensors that's supposed to detect bad posture and send results to smartphones. Sadly, the Hicchair rep's phone was dead, so he couldn't give me a demo. Despite the sparse turnout, hope ran high at the event, and Africa Tech Now's vendors were optimistic about their countries turning a tech corner. "We're pretty much doing everything we can, and the government is trying to help as much as they can," said Hicchair CEO Sai Khalil. In the meantime, he'll continue to look for funding. And a demo phone that won't conk out.